The on-loan American has been used sparingly these past few weeks due to injury. However, the midfielder was back in a green-and-white jersey for the first time since last month’s home defeat by St Johnstone. The 22-year-old replaced the concussed Martin Boyle in the closing stages of the first half and that was the kick-start the visitors needed. Hyndman took the second half by the scruff of the neck and was Neil Lennon’s side’s most influential player. He had an energy about him that most of his team-mates had lacked in an otherwise underwhelming first half. Looked assured in possession and can be more than happy with his display. There was a late change between the sticks as Adam Bogdan suffered a groin injury in the warm-up and was replaced by Ofir Marciano, who was making his first appearance of the season. The Israeli has had to bide his time following Bogdan’s arrival in the summer, however calls for Marciano, Lennon’s No.1 last year, to be restored to the starting line-up has been a talking point among supporters over the past fortnight. In truth, Marciano had little to do, one stop from Rakish Bingham in the first half was about it. Should Bogdan recover in time for next weekend’s showdown with Celtic at Easter Road, Lennon will have a big decision on his hands as to who he plays. The jubilation etched across the faces of the Hibs players following referee Bobby Madden’s full-time whistle was a sight in itself. Manager Neil Lennon was also quick to acknowledge the travelling supporters who have stuck behind their side despite the recent adversity. 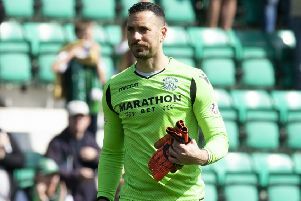 The Easter Road men’s slump has been well documented with just three points from a possible 21 since the 6-0 thrashing of Hamilton at the beginning of October. With games against both halves of the Old Firm and city rivals Hearts on the horizon, Hibs can at least approach these matches in a more confident frame of mind.